With the Democratic National Convention to be held here in July, Philadelphia has never been more ready to show itself off to the world. A bike-share station at Race Street Pier, a recently redesigned modern bi-level extension with spectacular views of the Benjamin Franklin Bridge. Credit Steve Legato for The New York Times With the Democratic National Convention to be held here in July, and its expected influx of 50,000 people, Philadelphia is more than ready to show itself off to the world. Thanks to a compact city center and plenty of bike lanes — plus a popular bike-share program — Philadelphia rewards exploration on two feet or two wheels. A college town, the city has a young vibe and a profusion of happy hours, as well as one of the most dynamic culinary landscapes in the country. The restaurant scene is expanding rapidly, from Frankford Avenue in the north to Passyunk Avenue in the south, discarding traditional “red sauce” Italian restaurants and working-class bars in favor of indie B.Y.O.B.s and elegant cafes. With an ever-increasing number of stellar museums, the transformation of industrial spaces into artist studios and a newly invigorated clutch of outdoorsy offerings, the city has never been more inviting — and not just to the Democrats. Explore street view, find things to do in Philadelphia and sign in to your Google account to save your map. 1. West Philly Wanderings, 3 p.m. Begin on the west side of town in the heart of University City. The Institute of Contemporary Art at the University of Pennsylvania (free) is the city’s most prestigious space for modern work, with exhibitions that don’t shy away from provocation. It hosted the first museum solo show for Andy Warhol and early work by Laurie Anderson, and its more recent productions, work from artists likeRobert Crumb, Gillian Wearing and Rodney McMillian, have been no less exciting. 2. Veg Out, 6 p.m.
Philadelphia is having a vegan moment. Chic, plant-based restaurants are serving some of the best cocktails and bar snacks in the city. Hit the happy hour at V Street, a hip “street food”-style vegan restaurant from the owners of the much-lauded Vedge. The cocktails here include the Kingston Cooler, with silver tequila, IslayScotch, carrot, ginger and jerk spice. Accompany them with a “Philly shawarma taco” of grilled and spiced seitan, broccoli rabe, hot peppers and tzatziki. 3. Dinner at Will, 8:30 p.m.
Pennsylvania’s strict liquor laws (liquor licenses are legendarily expensive and difficult to obtain) have spawned an impressive B.Y.O.B. culture, with chef-driven restaurants offering inventive, perfectly executed cuisine without the hefty booze markup. Will BYOB, helmed by the chef Christopher Kearse, is one of a handful of such B.Y.O.B.s on buzzy Passyunk Avenue, and its five-course tasting menu ($75) of exquisite dishes, like the milk-fed poulard with braised fennel, bacon marmalade and abalone mushrooms, is a thing of beauty. Book in advance. Digest on the short walk to Fountain Porter, an effortlessly cool neighborhood bar with an impressive list of local beers. Try a pint of Kenzinger, brewed in, and named after, a north Philadelphia neighborhood, for $3 (if you’re still hungry, the excellent burger is just $5). 4. Cheese in the Park, 10 a.m.
Di Bruno Bros. is a local institution; the original location in South Philly’s Italian Market has been around since 1939. The bigger, newer store at the corner of 18th and Chestnut is filled to the brim with epicurean goods. Pick up a rustic baguette, fig and acacia honey jam, and whichever cheese the cheese monger recommends that day, and walk two blocks south to Rittenhouse Square, the city’s people-watching hub. On Saturdays, a farmers’ market runs here until 2 p.m. (3 p.m. in summer), and you can find everything from draft kombucha to flowers to charcuterie from local, sustainably raised animals. Philadelphia is a sandwich town, and while the cheese steak gets all the glory, it’s the roast pork sandwich that deserves it. Get the real thing at John’s Roast Pork, a bare-bones South Philadelphia landmark with picnic table seating surrounded by shopping plazas and big-box stores. Join the long line of the devoted and pick up astellar sandwich ($10; order a large) with thin slices of moist pork, wilted spinachand melted sharp provolone. They do one of the city’s best cheese steaks, too. 6. Bikes and Hammocks, 1 p.m.
Philadelphia’s bike-share program, begun in 2015, now has more than 70 stations scattered around the city. 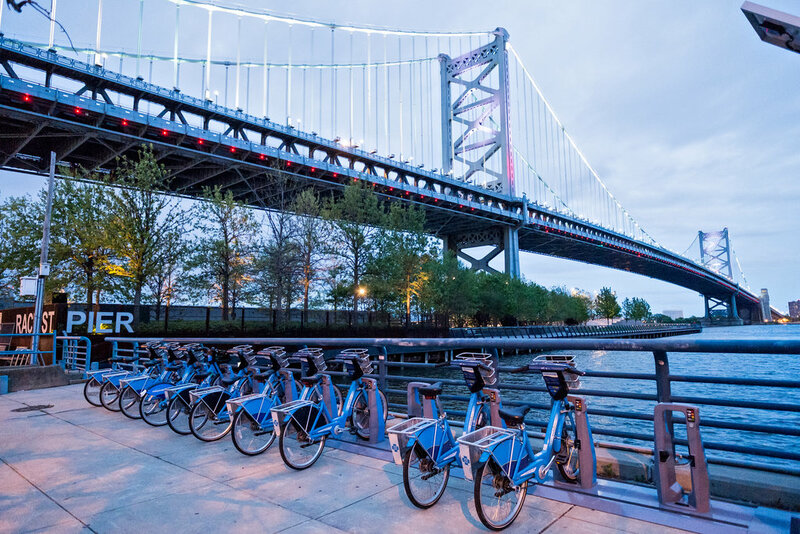 Rent a bright blue Indego bike ($4 for 30 minutes) at Front and Carpenter Streets and hit the Delaware River Trail, a recently developed path that borders the water. Ride north, stopping at Spruce Street Harbor Park, a boardwalk strewn with lights, hammocks, a beer garden, snacks from Federal Donuts and the Fat Ham, and barges housing pop-up restaurants by Jose Garces (May through September). Generally between late November and late February, the Olympic-size Blue Cross RiverRink is open to the public, alongside firepits and a winter garden. Hang a right onto the Race Street Pier, a recently redesigned modern bi-level extension with spectacular views of the Benjamin Franklin Bridge, where free outdoor yoga classes are held in warmer months. 7. Frankford in Fishtown, 3 p.m.
Ride that bike up the trail north to Fishtown, a neighborhood that’s seen huge changes. 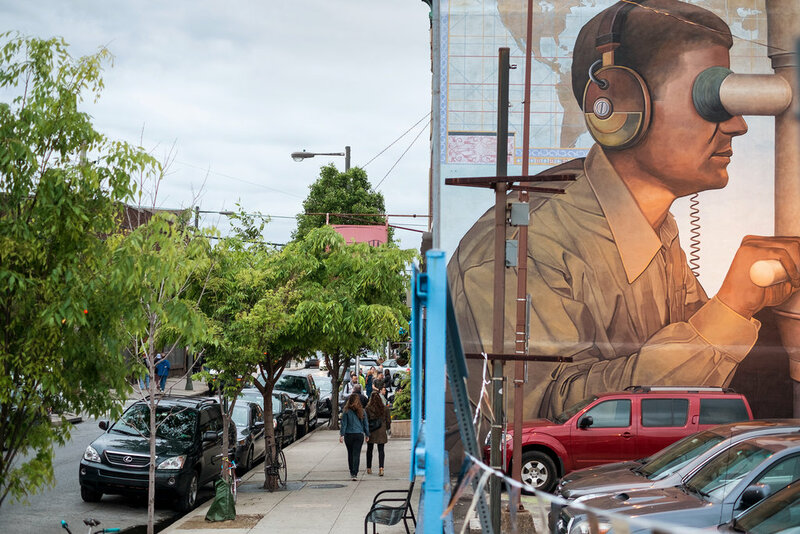 Frankford Avenue is more evidence of Philadelphia’s new hipness, a street lined with boutiques, cafes and restaurants. 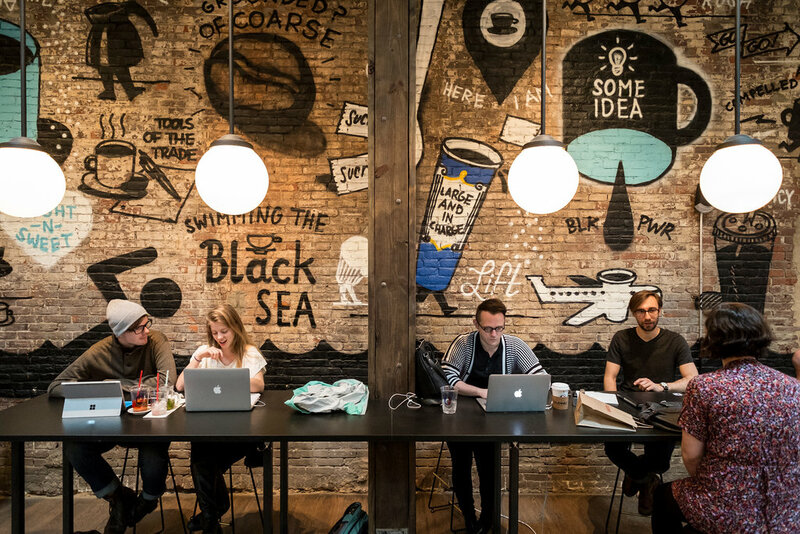 Pop into La Colombe, a cavernous industrial-chic coffee shop that distills its own coffee-infused rum, for a creamy “draft latte” (cold brew coffee and milk pressurized with nitrogen — add a shot of the rum for $6). Continue north, noting the Shepard Fairey mural on the building at 1228 Frankford Avenue, then stop at Pizza Brain. With claims to being the world’s first pizza museum, the dining room displays goofy pizza-themed memorabilia like movie posters, but the pizza itself (enormous slices topped with ingredients like Grana Padano, honey goat cheese and smoked bacon) is top-notch. Next door Little Baby’s Ice Cream makes its small-batch ice cream in flavors like Balsamic Banana. 8. 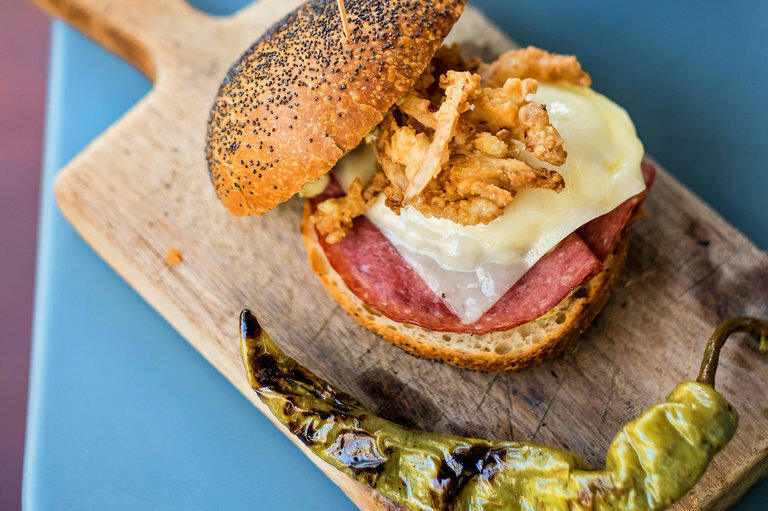 Neighborhood Fare, 6 p.m.
Southwark was a beloved neighborhood cocktail bar and restaurant before it was sold in 2015, but, happily, Chris D’Ambro and Marina de Oliveira, the new owners,have only made it better. The oft-changing menu features perfect versions of classics like steak tartare and smoked mackerel pâté, as well as more outré items like asparagus and ramp custard with crispy poached egg, morels, fava beans and hazelnuts. Cocktails, which include a version of the Colonial-era drink Philadelphia Fish House Punch (a mélange of cognac, bourbon, rum, peach liqueur, lemon sherbet and nutmeg), haven’t lost the old Southwark zing, either. Dinner for two, around $90. 9. Arts on the Fringe, 8 p.m. 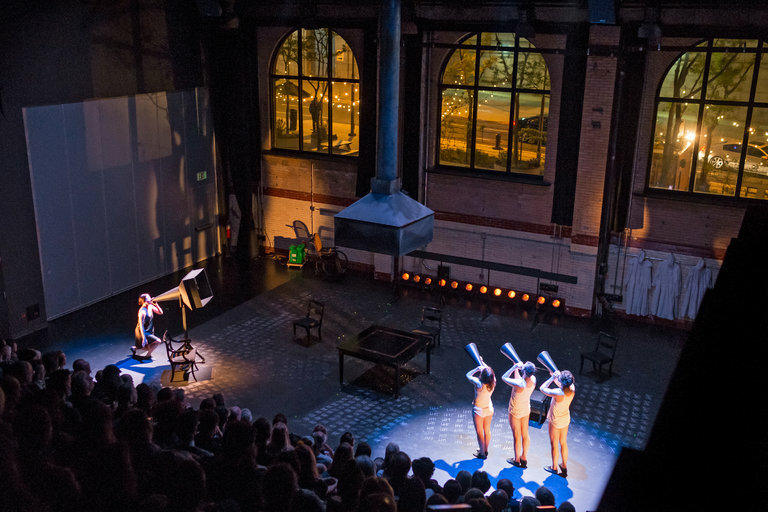 The redone Fringe Arts building, a former fire truck pumping station, now hosts the best and most eclectic of the city’s live dance and conceptual performances, in addition to being the headquarters of the city’s annual Fringe Arts Festival (held in September). Alternatively, head to Underground Arts, a basement venue that’s rough and ready with cheap drinks, limited seating and musical acts as varied as Bob Mould and Insane Clown Posse. 10. After-Hours Oysters, 10 p.m.
It’s worth waiting in line for the Saturday night “buck a shuck” happy hour at the Oyster House, which has been serving fresh East Coast seafood since 1976. 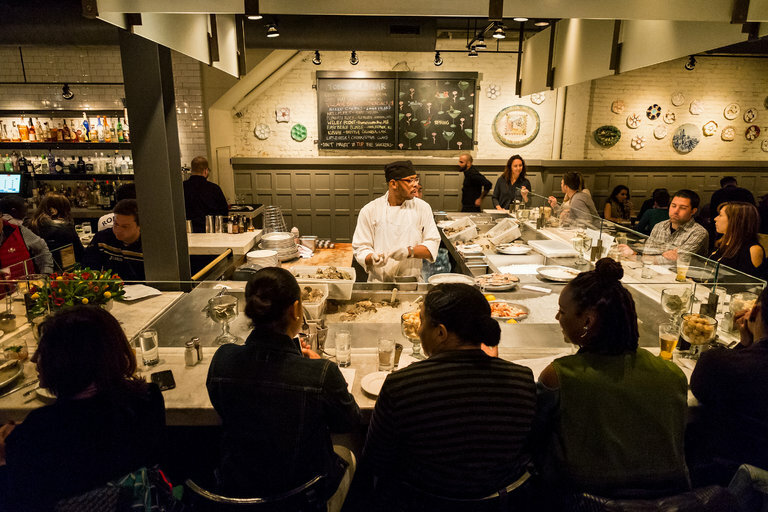 The restaurant now has a modern aesthetic — gleaming white tiles, marble bar and high wooden tables — and draws a well-heeled crowd for the bargain oysters: $1 each from 9 to 11 p.m. Pair them with the house punch of red wine, apple brandy, lemon, ginger and cinnamon, or stay traditional with a classic gin martini with house-made vermouth. 11. Morning High, 10 a.m. The new Manhattan branch of High Street on Market might have a line out the door, but you can grab a table at the original if you time it right. Standout items from Eli Kulp’s highly skilled kitchen are the baked goods — the “red eye” danish, a pastry topped with country ham and coffee-spiked gravy, has graced the cover of Saveur — but for something more filling try the Hickory Town breakfast sandwich, stuffed with eggs, Lancaster bologna and Amish horseradish Cheddar. Coffee is from local roaster Rival Brothers. Breakfast for two, $30. It’s hard to believe that the Barnes Foundation’s 3,000-strong collection of Impressionist, Post-Impressionist and early modern paintings was once owned by a single man. Take the hourlong tour that starts at noon ($45, includes $25 admission fee; book far in advance) for insights into the work and the history of Dr. Albert C. Barnes’s once-private collection. It’s unthinkable to leave the city without stopping at a Wawa, the convenience store that — according to locals, at least — has the best coffee, hoagies and meatball subs around. Follow up your museum visit with a trip to the new location at Broad and Walnut Streets. Pick up an Italian hoagie, and stroll up to City Hall to eat it at the newly designed green space Dilworth Park, under the benevolent gaze of the William Penn statue atop the building. Located in a very central spot formerly occupied by the Four Seasons, The Logan Hotel (1 Logan Square; theloganhotel.com; doubles from $199) opened in December 2015 after a thorough redesign. Note the massive chandelier constructed from portraits of famous Philadelphians in the foyer. This small hotel (1715 Rittenhouse Square St.; rittenhouse1715.com; doubles from $249) was once a carriage house and has a comfortable, homey atmosphere in its 23 rooms. The helpful staff have plenty of local tips. We were there in November, last year. We are returning this year- a great city! Can you tell us where? California is a huge state and a clue to your destination would help us to help you. What time of year? For how long? Alone? Article in the Sunday New York Times travel section tomorrow, entitled "36 hours in St. Bart's. Nice mention of Andy's, Eddy's, too.